Ornamental Grasses | Faddegon's Nursery, Inc.
Jun 3, 2016 | Perennials, What's New? From short blue mounds of delicate foliage to tall, plumed and arching grasses that rustle and sway in the breezes, ornamental grasses bring rich textures and colors to the garden. Some even provide a changing show of color through the seasons making the landscape come alive beyond the flowering of other garden plants. Whether as an accent or in a grouping you can depend on finding a variety that fits your garden style and growing conditions. ‘Karl Foerster’ – is an award winning ornamental grass growing to 4 feet when planted in full sun. Beautiful green foliage gives way to reddish-brown and cream plumes beginning in late spring. The stalks continue to change color resulting in a golden brown in fall.Calamagrostis is also called feather reed grass. It is the first of the ornamental grasses to show foliage in the spring. Spikelets cluster together to form the plumes which show a variety of colors described as brown, red, purple, pink and cream. ‘Karl Foerster’ is by far the most used and well-known of the feather reed grasses. A deer resistant sedge grass that will add brightness to the shade garden with beautiful variegated foliage. It can be planted in full shade or part sun. Growing to 1 foot in height and spreading from 1-2 feet, it makes a great filler or border to keep the garden green. Zones 5-8Carex is also known as sedge grass. There are over 1,500 species, the most of any of the genus. Carex has short triangular blades and blooms and makes a great companion for hostas. Varieties range from 6″ in height to 15″. Other great varieties: ‘Golden Fountain’, ‘Silver Sceptre’, ‘Everest’ and ‘Evergold’. Part Sun to Shade‘Elijah Blue’ – Easily the most popular of the blue fescues, ‘Elijah Blue’ keeps its powder blue color all season. Small and naturally clumping, it produces tall “flowers” in early summer. This short grass is always a good choice for a rock garden as it can withstand drier conditions and full sun.‘Beyond Blue’ – Similar to ‘Elijah Blue’ but a bit more tolerant of heat, humidity, and poor soils. An improved variety.Fescue – Blue fescues offer soft blue-gray blades naturally mounding and reaching 6 to 18 inches depending on the cultivar. They are semi-evergreen and need to be planted in a well-draining soil. Fescue tends to be a very tidy plant making it perfect for creating a border. Can be divided often after the first year. 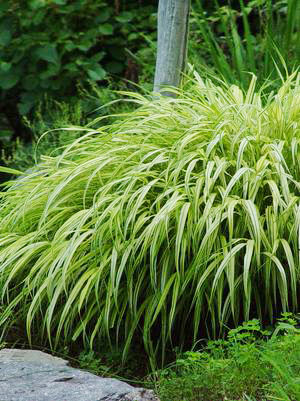 Full SunHakonechloa macra ‘All Gold’ – A truly bright grass for the shade garden. The color ranges from yellow to lime green depending on light exposure. Less shade will bring out the yellow but not to be planted in full sun! This grass is a real favorite!Hakonechloa – A native of Japan, hakonechloa is also known as “forest grass” and comes from the Mt. Hakone region. There it is known to grow on cliffs and in woodland areas cascading like a waterfall of foliage. Hakonechloas are hugely popular adding texture and movement similar to bamboo but much easier to maintain. All cultivars enjoy rich moist soil. Happily spreads on its own and can be divided after the first year. Shade to Part ShadeHakonechloa macra ‘Aureola’ – A beautiful cultivar! Variegated blades of gold and bright green with a tinge of pink in the fall make ‘Aureola’ a lovely addition to the shade garden. It’s an award winner. It grows from 10 to 14 inches. Miscanthus sinensis ‘Graziella’ – A great substitution for pampas grass in the northern garden. White plumes begin to show in late summer above narrow 5 foot leaves with the typical arching form. The fall foliage turns a coppery red. Zones 5-9. Plant in full sun. Can tolerate hot dry situations.Miscanthus sinensis ‘Gracillimus’ – An extremely elegant grass with narrow arching foliage growing to 6 feet. The plumes appear in the fall as the leaves become bronze in color. ‘Gracillimus’ means graceful!Miscanthus – Maiden grass is the quintessential ornamental grass. It really has it all! Beautiful architectural foliage rises up giving way to silky plumes. It’s deer resistant and tolerates hot dry situations. An amazing look as a screen or to give the garden a coastal or prairie feel. Maiden grass is left uncut through the winter and is known for its straw-colored presence above the snow. Other great varieties: ‘Porcupine’, ‘Little Zebra’ and ‘Gold Bar’. Full Sun‘Northwind’ (Panicum virgatum) is a very hardy warm season variety growing to 5 feet and spreading from 2 to 3 feet. The blades are blue-green turning golden in the fall. Truly elegant and sturdy, ‘Northwind’ looks beautifully delicate despite its strength once its airy plumes appear! Zones 4-9. Plant in part to full sun.‘Shenandoah’ – Also known as red switch grass. Shorter than ‘Northwind’, usually topping out at 3½ feet, ‘Shenandoah’ goes through a stunning color change through the seasons. In Spring, green shoots begin to grow becoming tinged with red in early summer. As the season wears on, the color intensifies until the blades are entirely burgundy. Plumes begin pink turning to silver in the fall. Zones 4-9. Plant in part to full sun.Panicum – This North and Central American native is also known as switch grass. Panicums have an upright habit and are usually grown for their height and screening ability. The plumes begin to show in July and create a wonderful soft hazy effect. Amazing either as a specimen or en masse. Other great varieties: ‘Cloud Nine’, ‘Dallas Blues’ and ‘Cape Breeze’. Full to Part Sun‘Burgundy Bunny’ – In late spring, the green foliage of ‘Burgundy Bunny’ begins to turn bright red becoming fully red in the fall. Soft gold bottlebrush plumes show in mid-summer. A beautiful grass growing from 12 to 16 inches. Plant in full sun in a rock garden for a beautiful color show!‘Desert Plains’ – Lovely fine green blades form a clump reaching 3 to 4 feet in height. As the season progresses, blades begin to turn deep red in mid-summer. In fall, this ornamental will turn shades of gold and orange. Soft gold bottlebrush plumes show in early fall above the foliage. This grass has an ever-changing nature adding much to the garden! Plant in full sun. Pennisetum – Better known as fountain grass, Pennisetum is characterized by its vibrant foliage and bottlebrush plumes. When in bloom Pennisetum arches dramatically, when a breeze comes up the plumes bob up and down beautifully. Plant if full sun. It won’t mind humidity either . Other great varieties: ‘Hameln’, ‘Red Head’ and ‘Piglet’. What you can expect after planting ornamental grass. Grasses are very easy to take care of! When planting ornamental grasses make sure to water in well and continue to water as you would with any other new plant for the first season. Beyond this, grasses are very drought-tolerant. Large grasses should be cut back to about 6” in late winter. Leaving the stalks up through the winter protects the crown and is, in fact, a desirable feature of ornamental grasses. If you really can’t live with the look in winter then you may cut them back in late fall but only cut them by half. Some gardeners do cut them all the way down in the fall, however, there is much controversy about adverse effects on the plant. Shorter grasses should also be cut back in late winter but to 3” or so. Are you waiting for your grass to begin growth in the spring? Ornamental grasses don’t begin poking up until the ground is warm enough. It’s not uncommon to fear the worst as grasses will definitely begin showing signs of life later than many other garden plants. If you did not cut back your grasses in late winter, this will cause the new shoots to come up a few weeks later as the dead foliage prevents sun and warmth from getting to the crown.